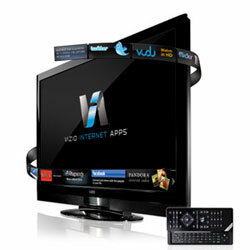 VIZIO XVT (Xtreme VIZIO Technology) Series HDTVs are now on general release. They feature the latest in picture quality in the sleekest designs. The range includes five screen sizes: 32 inch, 37 inch, 42 inch, 47 inch and 55 inch, the XVT553SV, XVT473SV and XVT423AV offer an unprecedented 10,000,000:1 contrast ratio. Included in all XVT Models is the VIZIO Internet Apps, with integrated Dual Band 802.11n Wi-Fi wireless networking and for added comfort a Bluetooth/IR remote with slide out QWERTY keypad. By using it inbuilt Dual Band 802.11n Wi-Fi connector the VIZIO SVT series brings the best of the web in to your home through the VIZIO Internet Applications, the industry leader with over 75,000 movie and TV show options and 10 Million songs. The series offer High definition audio with its integrated SRS TruSurround™ HD premium audio processing technology. In addition, SRS TruVolume™ eliminates sharp jumps in volume that may be heard when switching from channel to channel or coming in and out of commercial breaks. The 55” XVT553SV, 47” XVT473SV and 42” XVT423SV have 5 HDMI 1.3 inputs, the 37” XVT373SV and 32” XVT323SV have 4 each. For providing connectivity to other entertainment systems like disc players, portable devices and gaming consoles.